Verne Shaffer, 87, continues to create and work in his studio, a converted barn in his hometown of Princeton, Illinois. He graduated from Beloit College where he later taught art. For most of his career, Shaffer sculpted in Clinton, Wisconsin. His artwork consists of steel and brass, welded or cast, and wood and cast concrete. His work is exhibited with major commissions throughout the United States. Verne Shaffer has won multiple awards including awards from the Governor and lifetime achievement awards. In June, 2014 Shaffer received a Certificate of Recognition from Governor Scott Walker for having more public art than any other artist in Wisconsin and for his work as an art educator at Beloit College. These shows will consist of loaned Shaffer art from private collections. It will be a once-in-a-lifetime opportunity to see this art. There will be a few featured pieces at each exhibit marked with QR codes for additional information on the 150 privately-owned art pieces in the exhibits. A road trip to 14 cities in Wisconsin to view Shaffer’s public art has been developed. Each piece will be marked with a QR code allowing the viewer to connect to YouTube via a smart phone to see and hear the artist talking about the specific piece they’re viewing. A large 2’ X 2’ printed map with corresponding QR codes will be available around the State. The printed maps will include QR codes which connect to Google Maps providing turn-by-turn directions to each of the public art pieces. This is what the sign will look like at each location. The QR code is below the title, and can be scanned by your phone to receive the Youtube video of O.V Shaffer speaking about that particular work. 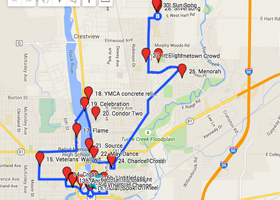 This route shows the artworks in Beloit. The interactive map pinpoints the location of all the pieces and has information about each of them. 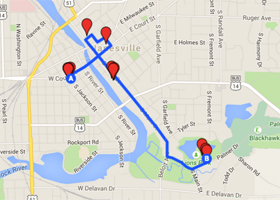 This route shows the artworks in Janesville. The interactive map pinpoints the location of all the pieces and has information about each of them. 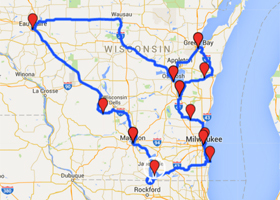 This route shows the artworks in Wisconsin. The interactive map pinpoints the location of all the pieces and has information about each of them.